﻿ Mission Shakti: What Next? In a remarkable technological feat and a clear demonstration of national resolve, India conducted Mission Shakti, an anti-satellite (ASAT) missile test, on March 27, 2019 by successfully engaging an orbiting target satellite at an altitude of nearly 300 km. In the process, it emerged as the fourth member of the exclusive club of space powers (US, Russia and China) that have had demonstrated ASAT capabilities. Mission Shakti demonstrates the “nation’s capability to defend its assets in the outer space,” besides vindicating the technological competence of the Defence Research and Development Organisation (DRDO), the exclusive research and development (R&D) department of the Ministry of Defence. That the feat was achieved with a totally home-grown technology was not only an icing on the cake, but a big boost to the on-going Ballistic Missile Defence (BMD) programme. Having achieved technological success and informing the world about India’s new deterrent capability in space, the DRDO has a few more crucial tasks to perform before making possible the full exploitation of outer space for military purposes. The ASAT test of March 27 is significant for several reasons. Apart from gaining India global status and a greater say in international negotiations on outer space, the test’s real significance lay in the demonstration of the progress made in the BMD programme under which the DRDO is developing, in two distinct phases, a two-layered shield against hostile missile attacks. Under Phase-I of the programme, which envisages the interception of up to 2000 km range ballistic missiles in both the endo-atmosphere and exo-atmosphere in the altitude range of 15-25 km and up to 140 km, respectively, the DRDO has so far carried out 13 tests. With the required success achieved through these tests, Phase-I is now ready for operational deployment, possibly under the command of the Indian Air Force. 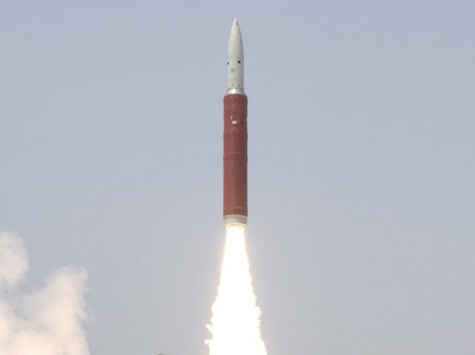 It is important to note that the missile used for the ASAT test was not part of the BMD programme’s existing interceptor missile inventory, namely the Advanced Air Defence (AAD) missile for endo-atmospheric interception and the Prithvi Delivery Vehicle (PDV) missile for exo-atmospheric interception, though it has benefited from the DRDO’s various missile developmental programmes, including BMD. A brand new three-stage missile with two solid rocket boosters, weighing 18 ton and measuring 13 metres, was independently developed for the ASAT test after the government go-ahead about two years ago. Developing a new missile in a short span of time, with 150-odd scientists working around the clock for the past six months, is indeed an accomplishment for the DRDO which is often subject to criticism for time and cost overruns as well as performance shortfalls of many of its programmes. The greater significance of the ASAT lies in its technological spin off for Phase-II of the BMD under which the DRDO aims to intercept longer range missiles of 5000 km range at a higher altitude of up to 400 km. It is important to note that though the target Indian satellite of the March 27 test was hit at a range of 283 km, the missile is actually capable of shooting down hostile objects moving at 10 km per second at a far higher altitude of nearly 1200 km. The technological capability for intercepting such a high velocity moving target at a higher altitude has a direct bearing on Phase-II of the BMD programme which envisages intercepting missiles travelling with a similar or lesser speed at a greater distance. Besides, the new missile developed for the ASAT test in record time will boost the confidence of DRDO scientists to undertake the development of more advanced missiles required for Phase-II of the BMD programme. Having demonstrated the technical feasibility, it is only natural that India would move towards weaponising this capability and all the associated space technologies so as to effectively deter adversaries from destroying Indian space assets. Going forward, this is where equally important challenges lie. To weaponise the ASAT capability and related technologies would require the government’s support and provision of resources. More importantly, it also needs a comprehensive defence space security architecture encompassing a defence space command for operational control of the weapon, as well as a dedicated space research agency to harness the full military potential of space. Given this reality of the military utility of outer space, it is only logical that India exploits its new capability in the fourth domain of warfare to further national security interests. India made a modest beginning in this regard in 2001 by implementing a space-based surveillance programme. A further impetus was provided when an Integrated Space Cell (ISC) was constituted in 2009 under Headquarters Integrated Defence Staff (HQ IDS) to coordinate the space-related aspects of the three defence forces. Now, this Cell needs to be upgraded to a dedicated defence Space Command to cater to all user services. It may be headed by a senior military officer, with a strong component of specialists from various scientific and technical organisations including DRDO, National Technical Research Organisation (NTRO) and the Indian Space Research Organisation (ISRO). The Command would also be responsible for the operational aspects of all space-based platforms and associated assets, besides laying out the strategy and doctrine for space warfare. In addition to establishing a Space Command, India also needs to create a dedicated Defence Space Research Agency (DESRA) to harness the entire spectrum of space technologies with defence applications. Such an agency may be set up under the DRDO, which has gained a head start in this crucial area. Suffice it to mention that, apart from the ASAT capability, DRDO has also developed an Electro-Magnetic Intelligence Satellite (EMISAT), which was launched on April 01, 2019. Besides, with the successful design, development and deployment of the Agni series of missiles, the DRDO has the requisite capability to meet the launch-on demand for urgent satellite launches. Going forward, SSA would play a critical role in mapping and cataloguing space-borne objects, including those of potential adversaries, for the purpose of devising suitable counter strategies. This would require development and deployment of a vast network of telescopes, long-range radars, and space-based sensors and a dedicated pool of experts to undertake the required task. All these complex and military grade satellites are primarily used for fulfilling specific military and intelligence community tasks ranging from active and passive intelligence gathering, communication mapping and imaging using advanced techniques like high resolution optical imaging techniques, hyper spectral and spectral mapping, synthetic-aperture radar (SAR) and other ELINT capabilities. To take advantage of the combined capability of a group of satellites flying in formation. Typically, swarm missions involving satellites are utilised for various tasks where orbiting satellites operate in various formations to achieve a variety of objectives ranging from killing adversary satellites to undertaking coordinated intelligence gathering operations. To meet the urgent requirement of launching satellites in a matter of a few hours, if not days. This capability should include rapidly deployable launch vehicles, launch facilities (both mobile and stationary) and reconfigurable / retrievable launch vehicles, among others. DEWs are fast emerging as an alternative to direct ascent ASAT missiles and are difficult to attribute to a source. DEWs include systems such as high-power microwaves, precision high power lasers and light-directed energy capabilities. These technologies are essential since they provide an effective mechanism for contactless, non-kinetic means to achieve superiority in space. It involves jamming and spoofing technologies to disturb the electromagnetic spectrum and other mission critical systems which are essential for conducting wars in a network centric environment. Some of the examples include global positioning system (GPS) / navigation system / communication system. Like DEWs, EW is also difficult to attribute to the source. Used to cause damage to adversary assets, these satellites use a combination of kinetic kill vehicles, high-power microwaves, lasers, jammers, robotic instruments and chemical sprayers. The technology demonstrated on March 27 may require continuous upgradation, in terms of miniaturisation of the missile, a more capable thruster and seeker, as well as multiple launch options (ground-, air- and sea-based), to make it more effective. Questions may be raised as to why India would need a DESRA-like agency while its existing civilian counterpart, ISRO, is doing a fabulous job in space launch and satellite manufacturing and assembly. The answer lies in ISRO’s civilian character, which enables it to access key technologies from other countries. ISRO is also committed to various international treaties that promote the peaceful, or non-military, uses of outer space. Changing ISRO’s character to an overtly military one may not be in the best interest of the organisation’s progress as well as the national interest. Hence the need for a military counterpart of ISRO. With the successful conduct of Mission Shakti, India has demonstrated its capacity in space weapons. It has also demonstrated the increasing maturity of its Ballistic Missile Defence programme, the first phase of which is ready for operational deployment. Having demonstrated its ASAT capability, India now needs to weaponise the technology and, at the same time, harness all possible space-related military technologies to put in place an effective deterrent against potential adversaries. To achieve this, India has a few more tasks cut out before it. It needs a comprehensive space security architecture consisting of a dedicated Space Command for operational aspects of space weaponry and an exclusive Defence Space Research Agency under DRDO to focus on scientific and technical aspects that include, inter alia, space situational awareness; intelligence, surveillance and reconnaissance; directed energy weapons; electronic warfare; formation flying; and rogue satellites. It is only when India has a deployable ASAT weapon and a range of other space-related capacities and capabilities to deter adversaries, can it claim to be a true military power in outer space.